Last week the very lovely people at The Juice Shed Company sent me some of their fruit juice cola to try and talk about. We have been around a while, producing good stuff to drink, we were the first people to make a Cola from fruit Juice, known as Juicy fuel Cola, we do a Cherry version too, try it you will be pleasantly surprised. We don’t use Preservatives or any of the Chemical stuff we leave that to others. We don’t need any added sugar in our drinks or sweeteners, use the right ingredients, for the best taste thats good for you! 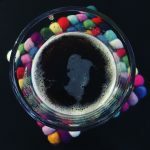 As well as producing a cola drink that is one of your 5 a day and made with natural ingredients, they also support the Teenage Cancer Trust – so all round good guys. So, I was very kindly sent 3 cans of Juicy Fuel Cola and 3 cans of Juicy Fuel Cherry Cola. The first one I tried was the Cherry Cola, now in all honesty I am much more used to my cherry cola consisting of a double cherry vodka with coke, so I was interested in trying something that wouldn’t give me a hangover or dance on a table. Drinking cherry cola always reminds me of being a kid – kids parties always had cool fizzy drinks like cherryade, orangeade and that wierd green on. Juicy Fuel Cherry Cola took me right back to childhood – it tastes exactly like you think it would, it was really nice, fruity and pretty refreshing. I asked Neil what he thought of the Cherry Cola – evidently he cannot hear me say the words “cherry cola” without giving me a brief rendition of “Lola”. He pronounced it “tasty” (once he’d finished singing). Foods that contain barley malt extract in smaller amounts can be eaten by people with coeliac disease. The Cola flavour was really nice, I think I preferred it to the Cherry flavour. It isn’t as fizzy as Coca Cola which for me is a massive bonus, you can actually taste the flavour rather than just the fizz. Neil preferred the Cherry Cola. 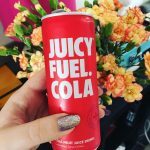 What I love about Juicy Fuel Cola is that you get the taste of Cola, but with natual ingredients, no artificial colours, sweeteners or preservatives and one of your 5 a day without having to eat an apple! What is not to love! You can catch up with the Juice Shed Company on Twitter, so make sure to check them out. I’d like to say a big thank you to the Juice Shed Company for sending me Juicy Fuel Cola to try. Have you tried it? Let me know below.